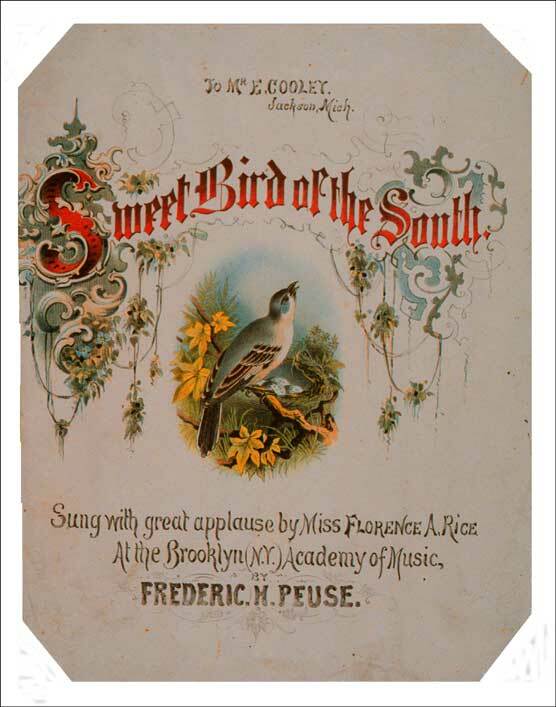 [Sheet music cover] To Mr. E. Cooley, / Jackson, Mich. / Sweet Bird of the South. / Sung with Great Applause by Miss Florence A. Rice / At the Brooklyn (N.Y.) Academy of Music, / By Frederic H. Peuse. Lithograph. N.d. Trimmed: 13&5/16 x 10&5/16 in (33.8 x 26.2 cm). Cincinnati: Ehrgott, Forbriger & Co. Langstroth Collection. Art and Music Department.